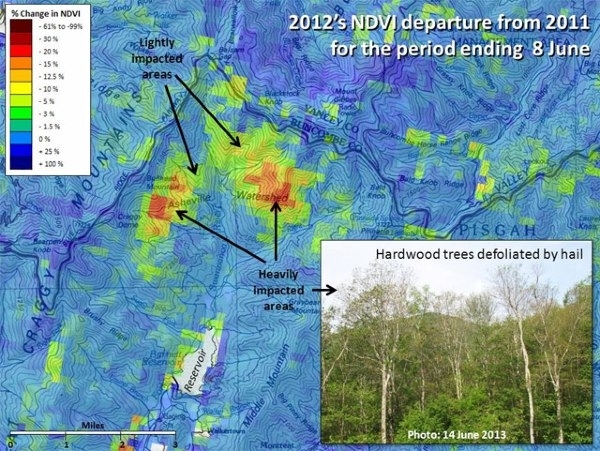 U.S. Forest Change Assessment Viewer map showing damage to the Asheville, North Carolina watershed following a 2012 hail storm. Image courtesy ForWarn. Working with the U.S. Department of Agriculture Forest Service and the U.S. Geological Survey, NASA’s Stennis Space Center developed ForWarn, an environmental monitoring and assessment tool that detects and tracks changes in forest vegetation nationwide. ForWarn software analyzes multispectral satellite imagery collected by MODerate resolution Imaging Spectroradiometer (MODIS) instruments on NASA’s Terra and Aqua satellites. Every 8 days, the software identifies in near real time potential forest disturbances caused by insects, drought, storms, blights, wildfires, and other events across the nation. The Forest Change Assessment Viewer for ForWarn enables users to view these changes on a map. NASA engineers used MATLAB® to help develop and deploy ForWarn while working with other government agency partners. U.S. Forest Change Assessment Viewer map showing vegetation changes in Gatlinburg, Tennessee, following a 2016 fire (fire perimeter shown in dark red). Image courtesy ForWarn. To develop a near-real-time system for detecting and monitoring vegetation changes across the 48 contiguous states, NASA engineers needed to analyze multispectral images captured by the Aqua and Terra satellites, build multi-timescale baselines of the gathered data, and then compare incoming data with the baseline to identify anomalies. Each day, MODIS data is generated for 14 gridded tiles that span the 48 states, with each tile comprising 4800 x 4800 pixels. Twice a year the system processes 15 to 25 terabytes of data when updating the yearly baselines used to identify changes in vegetation. NASA engineers needed to process and analyze large time-series data sets of images stored as mutidimensional arrays. They needed a development environment for interactively developing and rapidly evaluating new analysis algorithms. After demonstrating their algorithms, they wanted to deploy them into production without recoding. NASA engineers used MATLAB to develop the two key components of ForWarn: the Time Series Product Tool (TSPT), which temporally processes MODIS data, and the Phenological Parameters Estimation Tool (PPET), which uses the processed data to calculate the greenness magnitude and the day of year for the peak of the growing season and for other phenological parameters of interest to the U.S. Forest Service. For TSPT, the team at NASA wrote a MATLAB script that retrieves MODIS data stored in hierarchical data format (HDF) files in the NASA archive and imports the data into MATLAB. TSPT invokes Mapping Toolbox™ functions to convert imported latitude and longitude data to a projected map coordinate system. The TSPT Band Processing module, also developed in MATLAB, generates the normalized difference vegetation index (NDVI) from the time-series data, as well as soil, moisture, water, and other indices. Working in MATLAB, the team developed algorithms for TSPT to eliminate pixels distorted by clouds, shadows, the view zenith angle, and other effects. After merging data from the Aqua and Terra satellites into a single time series, TSPT uses Signal Processing Toolbox™ functions to identify and remove spikes and other outlying data points. Once the TSPT algorithms have removed the outliers they further filter and resample the time series using Optimization Toolbox™ and Image Processing Toolbox™. The TSPT algorithms apply a Savitzky-Golay filter from Signal Processing Toolbox to interpolate values for any missing pixels. The engineers used MATLAB, Optimization Toolbox, and Image Processing Toolbox to develop PPET, which performs curve fitting on the time-series data to identify vegetative states related to annual cyclical growing seasons, such as green-up, maturity, senescence, and dormancy. They later enhanced PPET to detect forest disturbances by identifying differences between daily satellite data and time-series baselines. Using MATLAB Compiler™, the team created standalone executable versions of their MATLAB based algorithms, which can be run by users who do not have MATLAB installed. The ForWarn team has won multiple awards for their efforts, including the Interagency Partnership Award, which recognizes federal employees from at least two different agencies who have “collaboratively accomplished outstanding work in transferring a technology.” The ForWarn team consists of the U.S. Forest Service, NASA, DOE Oak Ridge National Lab, U.S. Geological Survey, and University of North Carolina at Asheville.